A poem by Lantern Review contributor Vikas K. Menon is up on Pocket Broadsides today. Click here to read it on Tumblr! To see all of the Pocket Broadsides that have been posted on Tumblr thus far, visit the project’s main page at pocketbroadsides.tumblr.com. To read each new piece as soon as it is posted, follow us on Tumblr, or subscribe to the RSS feed. 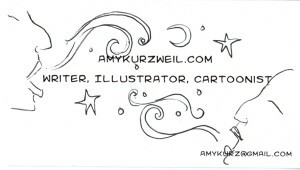 At AWP, writer and comic artist Amy Kurzweil did a beautiful little drawing on her business card for us in exchange for a Pocket Broadside. Her piece went up on Tumblr this morning (click here to see it larger). A poem by dual Kartika Review and Lantern Review contributor Michelle Peñaloza is up on Pocket Broadsides today! Click here to read “This Idea of Sin” on Tumblr. A micro-poem by Issue 3 contributor and current LR staff writer Wendy Chin-Tanner has been posted to the Pocket Broadsides Tumblr page. 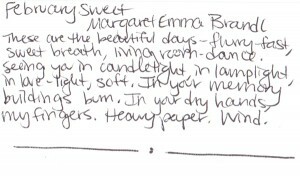 Wendy is the driving force behind the host of thoughtful, colorful interviews that we’ve had the opportunity to publish on the blog this year, and we are excited to have been able to include some of her own poetry in the Pocket Broadsides series. 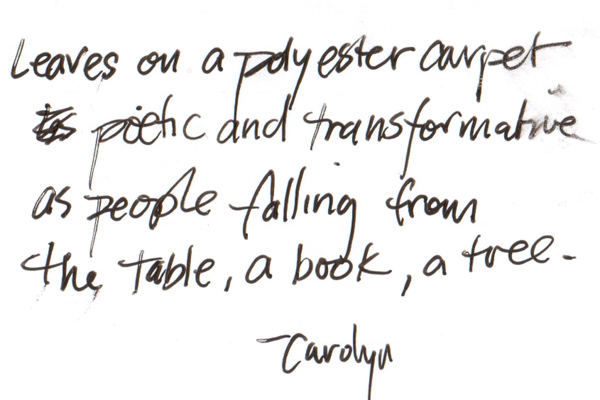 Please help us to spread the word by tweeting, re-blogging, and sharing her micro-poem wherever you can. LR News: Happy APIA Heritage Month! Just as we’ve done in past Mays, we’ve asked several of our contributors to write short guest posts for us in which they reflect upon their processes for writing a poem of theirs that we’ve published. This has always been one of our favorite series to run, and we hope that you’ll enjoy this year’s installments equally as much as those from years past. A new Process Profile will be posted each week (usually on a Wednesday), every week, for the duration of May. We had a lot of fun getting to work with our guest prompt-writers last May, so we’re thrilled to be able to continue our Curated Prompts series—in which we post writing exercises contributed by respected writers and teachers of Asian American poetry in lieu of our regular Friday Prompts—during this year’s APIA Heritage Month. This year’s lineup begins with Karen An-hwei Lee, whose exuberant, weather-inspired exercise will appear on the blog this Friday, the 4th. We’ve been waiting to re-open our reading period, because we have a very special announcement to make about our next issue. All will be revealed in mid-May, when we will officially open our doors to submissions for Issue 5. We’re particularly lucky, in a sense, that Poetry Month and APIA Heritage Month are back to back, because it means that we have the opportunity to celebrate Asian American poetry for two months straight! In addition to our May series, we will also be keeping April’s Digital Broadsides up on the blog, and will continue to post Pocket Broadsides on Tumblr. We hope that you’ll continue to share these projects far and wide as our celebration of Asian American poetry continues. Many thanks, and a very happy May to you. Issue 1 contributor Ocean Vuong‘s Pocket Broadside, a miniature poem called “Mother Tongue,” is now on Tumblr! To read all of the Pocket Broadsides that have gone up so far, please visit the project’s main page at pocketbroadsides.tumblr.com. As always, we’d be grateful if you helped us spread the word by following, reblogging, tweeting, or Faceb00k-sharing. We’re pleased to announce that a Pocket Broadside by Issue 2 Contributor Aryanil Mukherjee—an excerpt from his book-length poem, “Dead Fish Buoy”—is now on Tumblr. Please help us spread the word by following and/or re-blogging! To see all of the Pocket Broadsides we’ve posted so far, please visit the project’s front page, at pocketbroadsides.tumblr.com. Happy Monday! We’re pleased to announce that the first of the short pieces that were given to us at AWP in exchange for Pocket Broadsides is now posted on Tumblr. 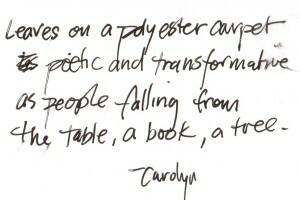 Click here to view this miniature poem by Carolyn.